On October 16, 2014 I lost my mother to an unknown infection that slowly took over her body and shut down her organs. In life she was a home daycare provider, Girl Scout troop leader, anything that she could do with kids. She loved her 10 grandchildren and 8 great-grandchildren very much, often having them spend the night at her house. She also collected bells and angels. In fact, when my husband and I got married, Mom took her whole bell collection to the reception so that everyone could ring a bell for a kiss! I keep a bell on my keychain to help me find my keys. At Mom's visitation I took that bell off and put it in her hand. (It was a rabbit and bird antiqued bell I had ordered here.) I told her I would keep one for myself and that when I was thinking of her I would ring it. I think I have just about worn that bell out! I also told her that when she wanted me to know she was close by or thinking of me that she could "ring" her bell. One night, a few days after her funeral, I was working late in my studio for the first time in weeks. I was trying to find a way to take both angels and bells and combine them into something I could make for my family to memorialize our mother. I had seen a wire angel design on page 67 of the Stylish Stringing catalog from Fire Mountain. I adapted the design a bit to make the angel head and body using the antiqued brass rabbit and bird bell for the angel’s skirt. The idea is to string the finished item for use as a pendant or Christmas tree ornament since that was another one of mom's loves. As I was making the proto-type I broke down thinking of mom. I cried for quite some time saying that I missed my mommy. (I am 48 by the way, lol.) I was just about to stop for the night due to the fact that I could not see through the tears to continue working on the design when I heard a bell ringing. It sounded just like the bells I was working with. Just like the bell I had given my mother. Believe me, I searched all over the house and even outside to see if there was anything that could have made that sound but there was nothing. I was convinced then, and still am now, that the bell I heard was from my mother letting me know she was close by and thinking of me too. There are many who would tell me I imagined it, and maybe I did, but the thought of Mom "ringing" her bell for me brought great comfort and lifted my spirits enough that I was able to continue the design to completion that night. 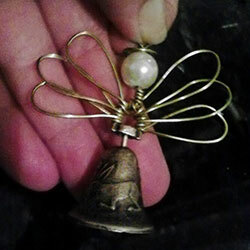 The photo is the first Angel Bell I made. It was to be the ornament on my tree this year, but I have since given it away. A co-worker lost a family member a few days later. I had taken the piece in to work to show others. I couldn't help but give her the Angel Bell in memory of her own loss. I shared the bell on my Facebook page and have had requests from many to make them one. One person want's 13! So, I continue to make the bells, accepting only the cost of supplies, to fill all the requests. And I know that when the sadness of my loss becomes overwhelming, as it surely will this first holiday season without Mom, that if I listen carefully I will hear her "ringing" her bell.